The road closure at Addenbrooke’s, due to begin today, has now been delayed until next Monday, 19th June. The City Deal has put the date back because there are extra underground utilities cables that need to be moved. 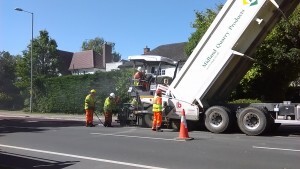 The road closure is to facilitate the construction of the next phase of the new cycleway on Hills Road and will involve the closure of the road between Long Road and the Addenbrooke’s roundabout to outbound traffic for approximately 14 weeks . There will be a diversion via Queen Edith’s Way and Fendon Road – see the plan on my previous post. The citybound lane will still be open to traffic. The City Deal assure us that they will still meet the finish date of early September. 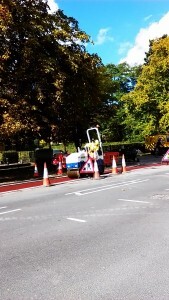 Hills Road cycleway update: The County Council have advised me that their contractors will be laying down the final stretch of tarmac on the new cycleway Hills Road this Sunday — between Glebe Road and the end of the cycleway near Queen Edith’s Way and Long Road. A reminder that there is still time to comment on the proposals for cycleways on Queen Edith’s Way and for the Fendon Road roundabout – until 1st August. All aboard the Abbey-Addenbrooke’s Express! Good news! We’re getting a new bus service. 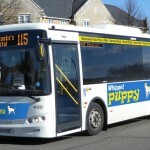 Starting next month, the new 115 service, run by Whippet, will run hourly between the Newmarket Road Park & Ride site and Addenbrooke’s Hospital. The bus will stop at both Long Road and Hills Road sixth form colleges, St Bede’s and the Perse. In the other direction, it drops you off at shopping and leisure destinations such as Sainsbury’s, Mill Road, the Abbey Pool and the Cambridge United football ground. The new service is a trial, funded by Section 106 developer contributions and will be made permanent if there is good take-up – so if you enjoy shopping, swimming or soccer, take a ride on the 115. Its first journey will be on Tuesday 3rd May. The Greater Cambridge City Deal has launched a consultation on five schemes designed to improve safety for people walking or cycling across Cambridge. The one that is of greatest relevance to us in Queen Edith’s focuses on the Long Road-Queen Edith’s Way- Hills Road junction, a key route for schools, sixth form colleges and Addenbrooke’s Hospital. 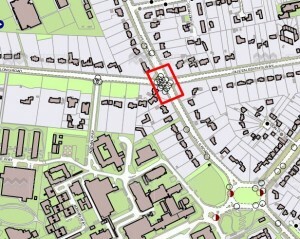 It’s a difficult junction to negotiate by bike or on foot, with fast-moving traffic coming from all directions and it’s a known accident cluster, as shown on the County Council’s map. I have lost count of the times people have said the latest new cycle lane being built on Hills Road should have started at this junction, rather than just after it. It’s an expensive project, and the money on the table is from the City Deal, a government-funded infrastructure programme granted by Nick Clegg when Deputy Prime Minister during the coalition government. There is a programme of exhibitions showing the proposals, and two are in our area: Addenbrooke’s on 18th January, and St John’s Church on 3rd February. Alternatively, you can see plans and comment on line, on the City Deal website. The consultation is open until 15th February. * Not, as it looks, a description of the city or the cyclists – better with a hyphen, I think! The north-bound cycleway on Hills Road is now continuous, running from just past Long Road to just before Purbeck Road. 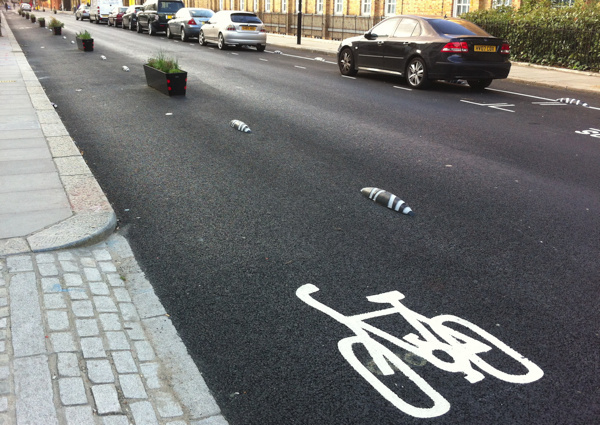 It is good for cyclists to be able to ride continuously, and for pedestrians to have their pavement space back. The south-bound cycleway works have not yet started. That side of the road has several junctions and lots of services cables and pipes under the pavement, at varying levels depending on the era in which they were installed. This is causing complications, making it unlikely that much progress could be made before the December ‘roadworks embargo’. OR PERHAPS MORE GOOD NEWS, IN A WAY? There will be no major works between now and the end of the year. To avoid leaving part-done works in place over Christmas, the contractor will now not be making a proper start on the southbound carriageway until January. 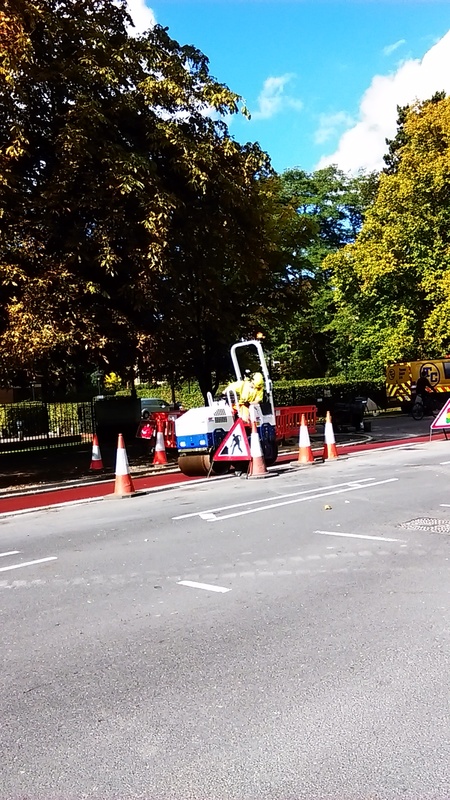 Instead, Skanska will use the time to finish off the northbound side (including yellow lines and cycle markings) and prepare for starting the cycleway southbound side of the road. This should ensure smoother progress in the New Year. The streetlights work should be finished by the end of November too; those holes in the pavement have been around for far too long already. Do read it – it’s a very good, and balanced report. The neighbourhood police report a burglary in Gunhild Way this month, with forced entry breaking glass in a back door. There has also been criminal damage in the vicinity of Long Road. Bicycles have been stolen in Holbrook Road (from a shed), Long Road, Hills Road and Addenbrooke’s. To give information anonymously about crime. Call 0800 555 111. Queen Edith’s being pushed eastwards! The Boundary Commission has just published proposals for changes to the Cambridgeshire electoral divisions, as part of its periodic review. The Commission is charged with arranging the boundaries of the divisions so that they all have roughly the same ratio of electors per councillor. For example, at present, Cherry Hinton has 6,344 voters, while Market Ward in the city centre has 8,495. The new boundaries are intended to come into effect in 2017, when we next have Cambridgeshire County Council elections, so the figures take account of projected housing growth, eg the Bell School. The other factor is that the total number of councillors will be reduced from 69 to 61. 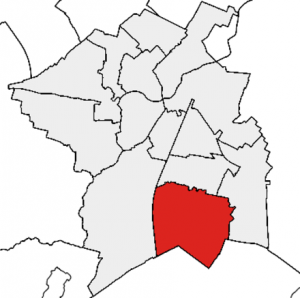 This review is for the county council elections and will not automatically change the Cambridge City Council ward boundaries, although the City Council may well follow suit so that people are in the same voting areas for all local elections. Who knows what impact it will have on a future parliamentary boundary review? Maybe there will be a chance to address the odd situation of Queen Edith’s having a different MP to the rest of Cambridge, but there are no guarantees. Although Queen Edith’s is in between the two extremes with just over 7,000 voters, the proposal is to shift us eastward in order to get the numbers right on other wards which will have greater housing growth. 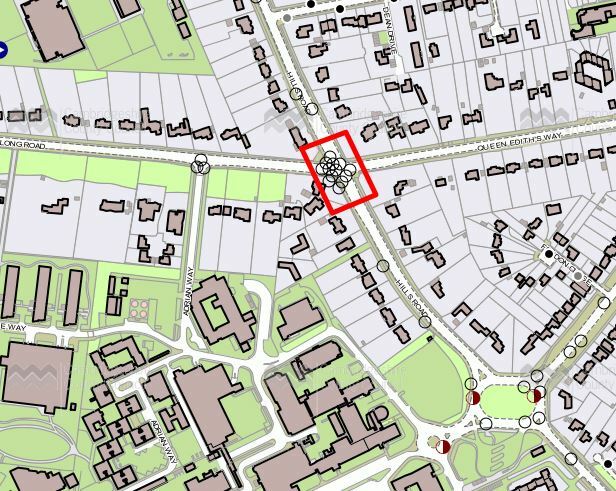 The Commission wants to move the odd side of Hills Road and everybody to its west into Trumpington, and to move parts of Cherry Hinton Road and streets leading off it into Queen Edith’s. Ironically, that would echo the ward boundaries before the last review. We’d lose Addenbrooke’s and Long Road Sixth Form College, but gain Hills Road Sixth Form College. Although the colleges don’t have any residents, it makes sense for the institutions that affect a community to be represented by the same councillor. The Commission is inviting your comments up until 6th July. 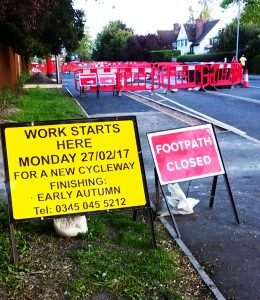 Work is set to begin in February on improving the Long Road pavements and cycleways. This is the result of a campaign run by a local resident, with the support of the Lib Dem Focus Team, who helped her present the project as a candidate for Section 106 funding — money contributed by building developers as part of their planning obligations. The project was supported by both the South Area committee and the County Council Cabinet and £180,000 was allocated to it. This will be good news for the many hundreds of pedestrians and cyclists who use Long Road every day, many of them going to school or college. The path will be widened and provide a more level surface for walking and cycling. There will also be more space for crossing Sedley Taylor Road. As part of the scheme, there will be a tidy-up of vegetation, and improvements to drainage. The Liberal Democrats in Queen Edith’s hold a regular advice surgery once a month. It’s my turn this Saturday, and I shall be at St James’s Church in Wulfstan Way between 10.30 and 11.30am. Our surgery craftily coincides with the church’s own coffee morning / bring & buy sale on too, so you can have a drink and a cake at the same time. Please come with any questions about local issues, or ideas. As a county councillor, I have best access to the county council officers handling education, transport, libraries, social care and children’s services but I’ll do my best to help with any other matters too. If I don’t have the answers on the spot, I’ll do my best to find out or share your question with someone who knows more than I do. So where does the armadillo come in? 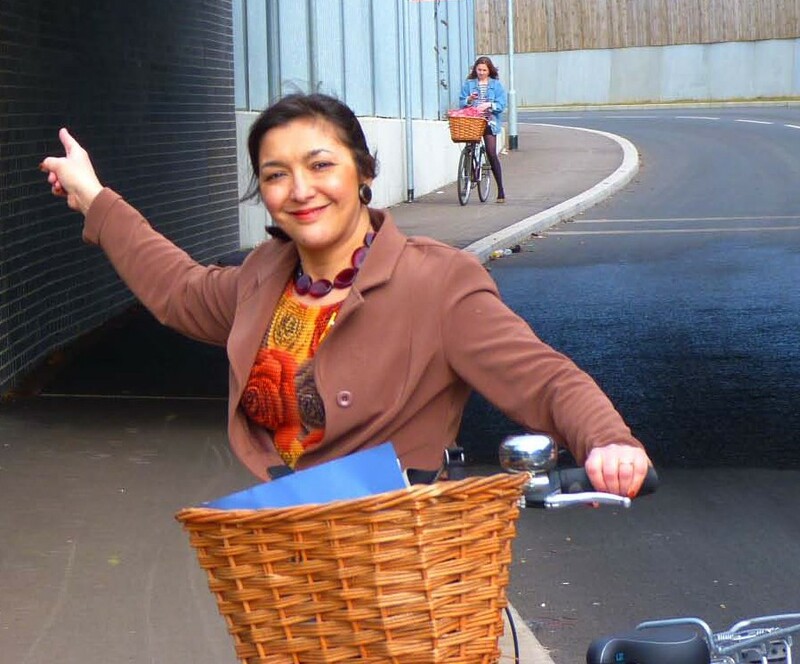 The Government has given Cambridge £8.2 million of funding for investment in Dutch-style cycling, with the objective of getting more people cycling. One of the projects the Council is considering is segregated cycle lanes on Hills Road between the Cherry Hinton and Long Road junctions. Others are in Huntingdon Road and Trumpington Road. I’ve been talking to transport officers at the County Council, particularly about the Hills Road scheme. They’ll be starting a two-stage consultation on the proposals soon, once options have been costed. Initially they are looking for information on journey patterns, routes etc and will then draw up detailed proposals taking into account people’s comments. They’ll be consulting residents, also businesses and other institutions. 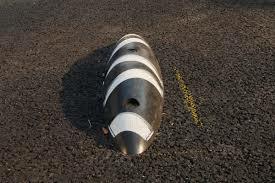 The cycle lanes would be marked by traffic separators, dubbed ‘armadillos’ by cycling afficionados. They keep cars out of the cycle lanes but because they are spaced out they allow cyclists to go into the main part of the road when they need to. Here is an example of them in use in Royal College Street, Camden. Intrigued, I asked to see an armadillo. I concede it’s a similar shape to the Dasypodidae, and hopefully it’s as tough. It was certainly very heavy, as I found out when I carried it home! I’ll be bringing one along to my surgery on Saturday: if you’re interested in the segregated cycle scheme, please call in for a chat. Second Saturday of the month, 10.30-11.30am. At St James’s Wulfstan Way when they have a coffee morning on, otherwise at the Coffee House. My own Light the Cycleway petition asked for lighting on the bridleway that runs alongside the Guided Busway, to make it safe to use at all hours. At present it is pitch black both in the mornings and evenings, and there have been several accidents, including falls, bumps and serious injuries such as a sprained wrist and smashed teeth. There is also the personal safety issue for women – something that has been raised with county council transport officers. Together with Trumpington councillors Caroline Shepherd and Andy Blackhurst as well as the support of my trade union UNITE, I launched a Light the Cycleway! petition asking Cambridgeshire County Council to install lighting along the cycle path in Queen Edith’s and Trumpington. The petition garnered 230 signatures and I presented it to Cambridgeshire County Council’s Cabinet on 22nd May.